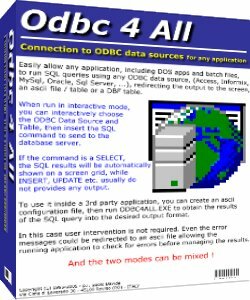 ODBC 4 ALL is a 32 bit Windows utility designed to easily allow any application, including DOS apps and batch files, to run SQL queries using any ODBC data source, (Access, Informix, MySql, Oracle, Sql Server, ...), redirecting the output to the screen, an ascii file / table or a DBF table. When run in interactive mode, you can interactively choose the ODBC Data Source and Table, then insert the SQL command to send to the database server. ...... grid (while INSERT, UPDATE etc. usually do not provides any output); you can browse the data there, send it to an Excel spreedshet, or create a configuration file to run the query again, later on, in batch mode. Batch mode is particularly useful to use it inside a 3rd party application. You can manually create an ascii configuration file, or let the screen scrig automatically creating it for you, then run ODBC4ALL.EXE to obtain the results of the SQL query into the desired output format. In this case user intervention is not required. Even the error messages could be redirected to an ascii file (for example if the SQL query contains a syntax error, or if the database server is unreachable because the server PC is down) allowing the running application to check for errors before managing the results. ODBC Viewer, View or edit any ODBC enabled database. Qweas is providing links to Odbc 4 All 2.2 as a courtesy, and makes no representations regarding Odbc 4 All or any other applications or any information related thereto. Any questions, complaints or claims regarding this application Odbc 4 All 2.2 must be directed to the appropriate software vendor. You may click the publisher link of Odbc 4 All on the top of this page to get more details about the vendor.